These numbers are largely in line with our numbers on electricity costs from various sources and since it has been over a year since I last posted my numbers on electricity costs and so I thought it worth updating. The headline: costs keep falling and energy parity is here. Electricity prices are coming down over the medium term from here. Our basic investment thesis is that coal, gas, oil, all have economics based on a “scarcity curve” – the more we use them, the deeper we need to dig to find more and more expensive they become to extract. Solar and battery power is on a “technology curve” the more the world produces, the cheaper it becomes. Our view is we will reach an energy parity where technology curve become an upper bound for the scarcity curve – the price of energy won’t exceed the cost of Solar+Batteries. Solar+Batteries are the “killer app” – extremely scalable once they reach an acceptable cost. And we are basically there. I have deliberately left Rooftop Solar out of the above tables, as they are less comparable than you would think. Roof-top solar has costs of around $0.13 which is much higher than the costs above. But that is not important. Rooftop solar is not competing with a coal plant, or even with utility solar. 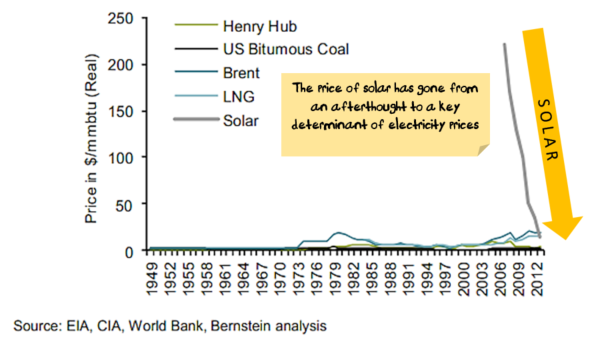 Rooftop solar is competing with grid power + grid infrastructure. It is an important distinction. The issue is that my panels produce power during the day when everyone else’s panels are also producing power, and so unless I use it myself to offset the above charge, I get paid a fraction of what the power company will charge my neighbour for using my spare electricity. Also, the peak rate (in the evening) for time of day pricing is much higher than during the day. At $0.31 for partial shifting (which is basically generating enough power to get you through the evening peak), having some batteries is profitable for anyone on time of day charges. A lot of this price comes from the discount rate, so if you are prepared to accept a lower return (and lock in electricity prices) then partial shifting can be worth it at current prices. But batteries aren’t quite a “no brainer” cheaper option. There are lots of questions that the above table raises. If everyone starts going off-grid who pays for the poles and wire, do we end up in a death spiral where more people leave the grid, raising the cost for those who remain which means more people leave and so on. While option 1 would be my preferred choice, I have a sinking feeling that option 3 will be the path of least resistance. The lobbyists will no doubt be hard at work on option 2 in case any government have the fortitude to explore option 1.